So far we have received 5 reviews of Love from Lexie . I think this book was brilliant but it was also quite sad I'm not going to tell you why because it might spoil the story. Half way through, there is a giant shock I couldn't believe it my eyes. Lexie is a quiet, sad girl who has been through allot in her life. Overall, I would recommend this book to anyone. Love from Lexie This book is full of twists and dramatic events and makes you feel like you can't put it down. Sometimes it can get tricky to understand but when it reveals in the end it makes sense. I really had feelings for some of the characters and hoped they would turn out having a happy time in the end. My favourite part was when Marley- a naughty boy - and Lexie - a quiet, shy girl - became friends even though they were very different. I loved the resilience of some of the characters. The book is about a girl who feels lost so she creates a band and makes some friends so that she finds herself. I would definitely recommend this book to some of the older readers and give it 10/10. It made me feel excited and worried at the same time. Will it make you feel the same? I hope you enjoyed my review and it made you want to read this book. Thank you for reading my review. 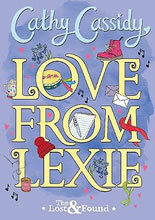 Love From Lexie is one of my favourite books so far; I've read quite a few! With stubborn Marley's (one of the main characters) personality being influenced by broken-hearted, hopeful Lexie, will they be able to end this slight drama-filled book end with the classic, Happily Ever After? Tragic and sad, the backstory belonging Lexie may bring a tear to the eye! With many sudden twists and turns, the Lost & Found, a group, ends up a little different to what Lexie pictured in her poor, messed up mind although it's wonderous and astonishing. Despite this, the young, innocent girl is left brewing in guilt and will Marley reveal his untold truth?Are you intrigued, bet you are? After each chapter, you are left thirsty for more-you can never put it down. Out of the many unique and different characters, honestly, my favourite is Bex, an orphan living with Lexie, is a punk, tomboy kind of girl with passion and sometimes, anger. Pick it up now, sit down and enjoy! You'll be left in shock after a certain persons secret is uncovered but it may explain a few things... Don't be put off by the cover; it isn't lovey dovey nor girly.